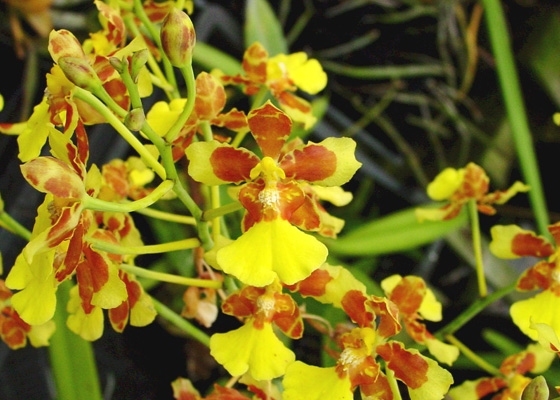 Known also as Oncidium cajamarco, named after the Peruvian plains of Cajamarco, the site where Pizarro met the Incas. Native to Ecuador and Peru, this plant grows terrestrially at quite high elevations. The numerous, vibrant flowers are bright yellow with patterns of amber barring, and are each about an inch tall. 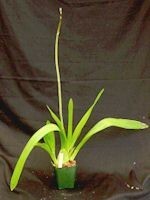 Inflorescences on the specimen plant grow more than three feet long. .Temperature Tolerant. August - September blooming. Species from Ecuador and Peru.